Abbey Coach House015394 44027work Self-cateringSituated in a quiet location in the heart of the Lake District, yet a short stroll from Windermere is The Abbey Coach House. A beautiful restored 19thC Lakeland stone Coach House, with great care and attention given to both accommodation and grounds. All rooms are ground floor, with easy access from the parking areas. These unique properties are within easy access of both Windermere and Bowness villages and also an ideal base for exploring the rest of the Lake District. Surrounded by the Lakeland hills, it is set in its own spacious grounds offering private parking and extensive gardens. 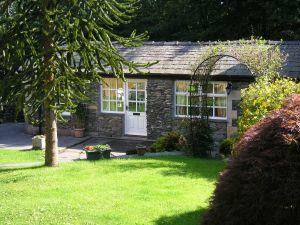 Walks are in abundance from your doorstep with Lake Windermere close by. Facilities include a barbecue and outdoor furniture. The bus route and train station are only a short distance if you want to leave your car at home. Walking,cycling or just relaxing, the properties are in an ideal location. Situated in a quiet location in the heart of the Lake District, yet a short stroll from Windermere is The Abbey Coach House. A beautiful restored 19thC Lakeland stone Coach House, with great care and attention given to both accommodation and grounds. All rooms are ground floor, with easy access from the parking areas. These unique properties are within easy access of both Windermere and Bowness villages and also an ideal base for exploring the rest of the Lake District. Short breaks and special offers available. 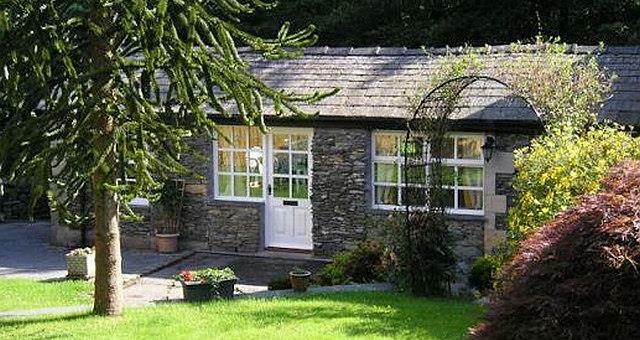 Free WiFi is available in both cottages. Children welcome from any age. From M6 jct 36 follow A590/A591 towards Windermere. Continue past the two Windermere town turnings on A591. Approximately 200m after the 2nd turning you come to St Mary's church. Turn immediately left into St Mary's Park. Take 3rd left driveway into Abbey Coach House.